George Graham played nearly all of his senior football in England, starting with Aston Villa then Chelsea, although he is best known for his time at Arsenal where he was an integral member of the Inter-Cities Fairs Cup winning side of 1970 and the League and FA Cup Double-winning side of 1971. His laid-back style of play earned him the nickname of ‘Stroller’ and he would enjoy spells with Manchester United, Portsmouth, Crystal Palace and California Surf. He was also capped by Scotland on 12 occasions. After a successful coaching spell at Palace and QPR, he was appointed manager of Millwall in 1982 where he turned around the fortunes of the south-east London club. 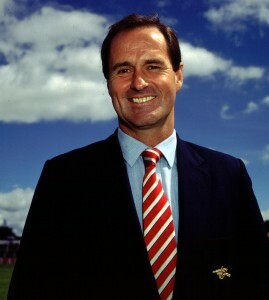 Arsenal came calling in 1986 and Graham had an immediate impact winning the League Cup in his first season. Two years later the ‘Gunners’ won the title in a dramatic and memorable season-finale at Liverpool. Needing to win by two clear goals to beat Liverpool on goal difference, Arsenal won 2-0 with the crucial second goal coming in injury time at the end of the match. Another league title was secured in 1991 followed by a domestic cup double in 1993 and the European Cup Winners’ Cup in 1994. Graham departed the club in early 1995 under controversial circumstances before coming back into the game about 18 months later, managing Leeds United, and then Tottenham Hotspur, where he won the League Cup in 1999.